Go to https://davis.dynatrace.com in a new tab and sign in. Click the User menu in the top-right corner of the window and then select Account settings. Navigate to Integrations > Slack in the navigation bar on the left. If you aren&apos;t already, sign in to Slack. 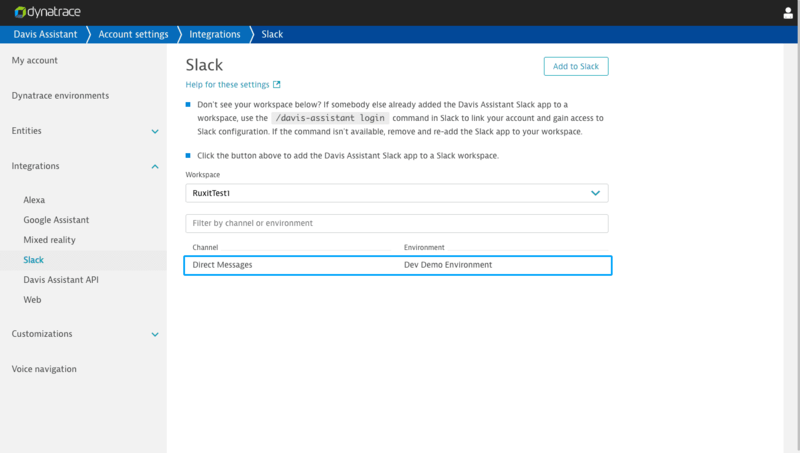 Select the Dynatrace environment you&apos;d like the Slack workspace to be associated with and click Select environment. Navigate to the channel you&apos;d like to add a Davis Assistant chatbot to in Slack and send /invite @davis. Then send @davis hello to begin interacting with Davis. Optionally, navigate to Account settings > Integrations > Slack and select a workspace and click on a channel. Add tags to the filter inputs and click Save. 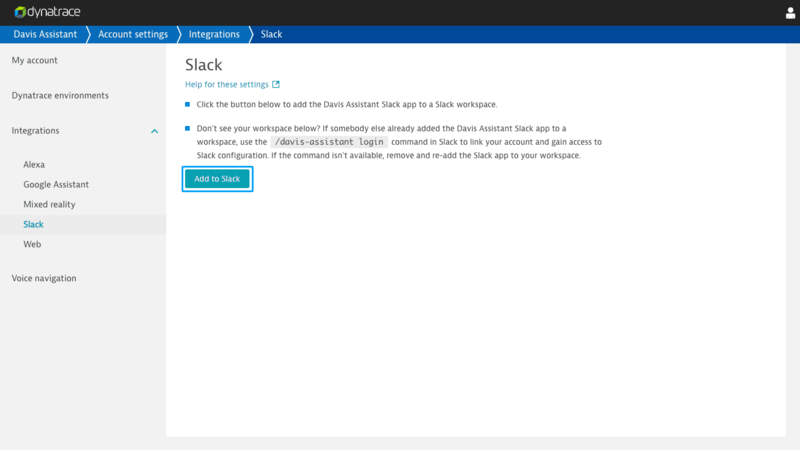 Davis Assistant allows all Slack users to link their Slack user account with their Dynatrace user account. Enter the slash command /davis-assistant login in Slack, then click the link provided in the response. You should now be able to access the Slack channel settings in Account settings > Integrations > Slack. To unlink a user, enter the slash command /davis-assistant logout. Invite a Davis Assistant chatbot to a channel by sending /invite @davis. Next, make Davis Assistant listen by mentioning him in a message such as @davis what happened yesterday?. Davis Assistant responds in a thread attached to the initial request. In the thread, Davis Assistant only listens to the user that initialized the interaction. Mentioning another user in the thread makes Davis Assistant stop listening. Davis Assistant also stops listening if another user adds a message to the thread. To resume listening in the thread, send a message containing @davis. When Davis Assistant is listening, you don&apos;t need to preface your messages with @davis. Other users in the channel can also interact with Davis Assistant and view your interactions. Buttons in cards only work for the specific user that Davis Assistant is responding to. As an alternative to interacting with Davis Assistant in a channel, you can interact directly with him in a direct message. Add "davis" to your Direct Messages list in Slack by clicking Open a direct message and typing davis. Direct conversation with Davis Assistant is not visible to other users and Davis Assistant will always be listening. You aren&apos;t required to preface messages with @davis in direct messages. 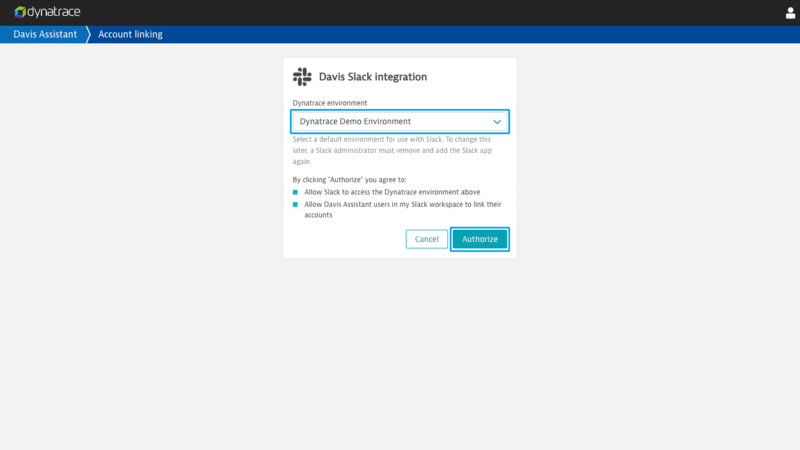 Davis Assistant supports interaction between a single Dynatrace environment per Slack channel. 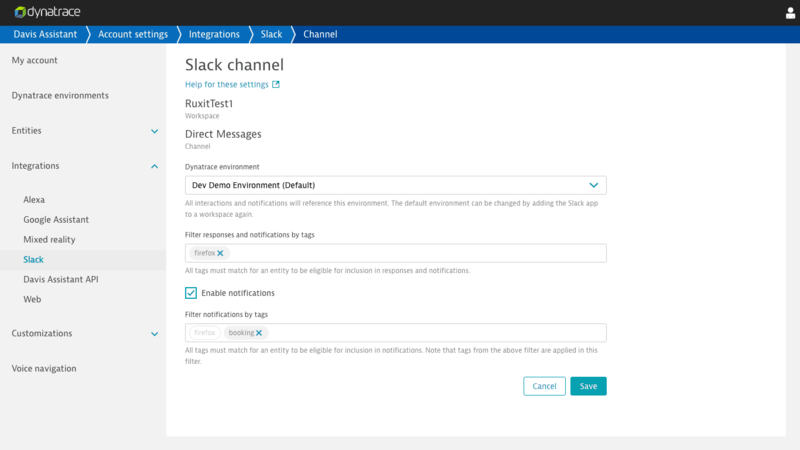 If you&apos;d like to change the associated environment, navigate to Account settings > Integrations > Slack and select a workspace and click on a channel. Change the environment and click Save. Each workspace can only be associated with one environment. 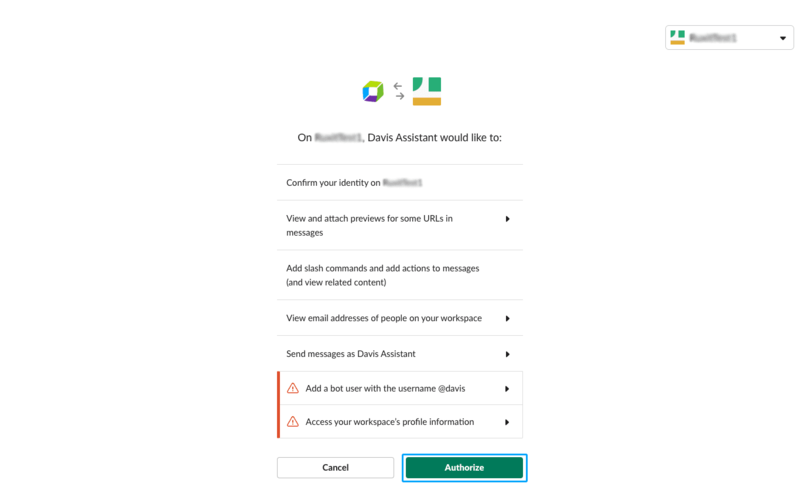 To enable notifications, send enable notifications in a direct message to Davis Assistant or @davis enable notifications in a channel that Davis Assistant has joined. Since notifications aren&apos;t associated with a single user, Davis Assistant won&apos;t listen in a thread attached to a notification, unless he is mentioned with a message containing @davis. Send /remove @davis in the channel you&apos;d like to remove the Davis Assistant chatbot from. Removing a chatbot doesn&apos;t remove the Davis Assistant Slack app from your workspace. Open Slack and click Manage apps under the Slack user menu, then click the davis app. Next, select the Settings tab and click the Remove App button at the bottom of the page.